With the stock market in a steep decline — the Dow dropped 1000 points last week, and is expected to be down 400 more at the open this Monday morning — one stock that was in need of a correction is MasterCard (MA). 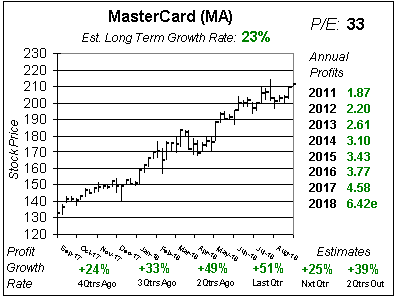 Although MasterCard is a safe, dependable stock the price of the stock is 29 times earnings. For comparison purposes, the stock had a median P/E of 16 to 28 in prior years MA was a publicly traded company (since 2006). And the year MA had a 28 P/E profits grew 68%. This year profit growth is expected to come in at just 9%. So the stock’s a little high. In addition to the P/E being too high, quarterly profit growth has slowed. I believe this issue will be temporary, and faster growth will someday return, but for now you are what you are. 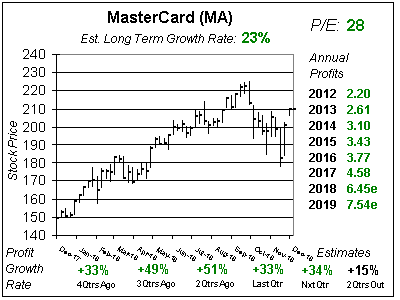 And MA is pumping out single-digit profit growth. The stock is deserving of a correction. Notice in the one-year chart the stock’s gone from $75 to more than $95 in a year. Around 25%. But profits haven’t grown that fast. The P/E’s just gotten larger, as growth has slowed. That’s dangerous. In the past management has stated it will hit 20% earnings growth. It’s done so for years and reaffirmed this after it reported earnings last qtr. But for now, with foreign exchange rates hampering profits, that’s not happening. Still, my Fair Value P/E of 25 is generous, but I feel it is accurate as this world-class company grows profits 15% to 20% regularly — without a down year. But this implies a $85 Fair Value. With the stock market crashing MA might come down to that number. MasterCard is a core stock holding for investors who desire growth with good degree of safety. But at this point the stock’s overvalued and is one of these names that was deserving of a correction. I would let the market take MA where it needs to be — in the mid-to-low $80s — before climbing aboard. View the Earnings Table here. View the Profit History here. View the Ten Year Chart here.